Not a direct inspiration but an overall feeling or emotion of sitting by the bay. 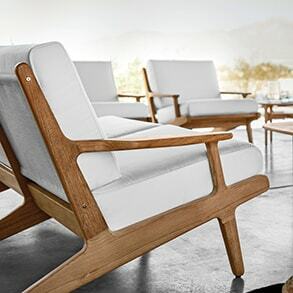 The reclined position is to emphasise an introverted and relaxed state of mind, therefore the name – Bay Chair. Buffed teak with White or Grey Headrest as standard colours. Seagull, Granite and Caramel headrests are available at an increased price. Click here for ottoman product specifications.